Hi, I’m Brenadan Shanhan. For the next three minutes I will attempt to make you fall asleep while explaining my latest suspension. Ville Leino was sure to be suspended for at least one game for his errant elbow on Matt Read, Wednesday. This much is true. It was a blatant head shot and Leino showed little regard for Read as he chicken winged the rookie. 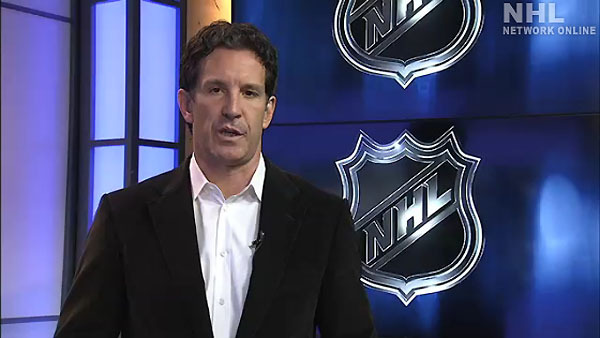 Two games seemed to be an appropriate suspension for the act, NHL Czar of Discipline, Brendan Shanahan decided one was enough. His decision makes enough sense, Leino is a fairly soft player who has no history of cheap shots. So, one game works in this case. Many in Buffalo are in an uproar over the lack of a suspension – or even a hearing – for Marc-Andre Bourdon. Bourdon put Nathan Gerbe into the boards with a hard check from behind. Gerbe’s numbers were showing the entire time, it wasn’t a case of the player turning into the check. Bourdon knew he had put a dirty check on the small winger as he was more than prepared to fight as he skated away. Yet, there was no supplemental discipline on, what appeared to be an equally egregious hit. There isn’t any use in complaining or whining that the Sabres are getting shafted. They aren’t. Certainly there are reasons that Shanahan felt Bourdon did not need a hearing. However, it would seem that Shanahan is losing touch over the standards he attempted to set when he took over this role. What this week’s suspensions seem to indicate (Kevin Porter was also suspended) is that Shanahan is attempting to keep the peace, but isn’t sticking to the standard he set in the preseason. Perhaps he saw the devastation that James Wisniewski’s eight-game ban brought upon the Blue Jackets, perhaps he is just softening up. Regardless, the NHL discipline system appears no more effective than when Colin Campbell was simply spinning the Wheel of Justice. When Shanahan started Shanabanning players and came out with these shiny videos most were happy to see the change. However, the videos are beyond stale (Is there anyone who can sit Brendan down and tell him to add a little personality to these videos? He is just as bad as Joe Buck.) and there doesn’t seem to be much progress being made to truly make a statement. One strong indicator was how he handled the Lucic/Miller and Tootoo/Miller incidents. While Lucic had a phone hearing, but no suspension, Tootoo had to sit for a pair of games. The explanation was that Lucic showed “no intent” to run into Miller, while Tootoo’s actions caused the collision. The tape is rather inconclusive, but if anyone showed more intent and had more room to move, it was Lucic. Still, it was a classic case of covering up after making a mistake to begin with. In his defense, Shanahan hasn’t had to deal with any major incident’s like Wisniewski’s hit. Since that occurred, there have only been a handful of borderline violations. There hasn’t been anything close to Aaron Rome, Mike Richards or Matt Cooke. Perhaps another major incident will occur and he will answer the bell with an appropriate suspension. He began the season showing that his reign would be far more rigid than Campbell’s. Yet, it has only taken two months for him to regress to the same level that Campbell operated on.